This book examines the role played by narrative and culture in the construction of legal cases and their resolution. The work is articulated in two parts. Part I recalls epistemological turns in legal thinking as it moves from theory to practice in order to show how facts are constructed within the legal process. By combining interdisciplinary paradigms and methods, the work analyses the evolution of facts from their expression by the client to their translation within the lawyer-client relationship and the subsequent decision of the judge, focusing on the dynamic activity of narrative constuction among those key actors: client, lawyer and judge. Part II expands the scientific framework toward a law-and-culture-oriented perspective, illustrating how legal stories take shape in the fabric of the authentic dimensions of everyday life. The book stresses the capacity of laypeople, who in this activity are equated with clients, to shape the law, dealing not just with formal rules, but also with implicit or customary rules, in given contexts. By including the illustration of cases concerning vulnerable clients, it lays the foundations for developing a socio-clinical research programme, whose aims including enabling lay and expert actors to meet for the purposes of improving forms of collective narrations and generating more just legal systems. 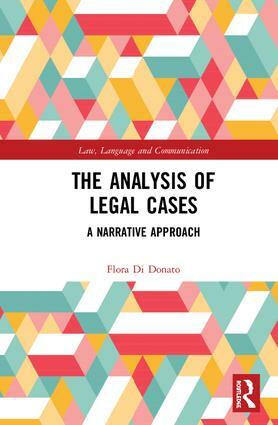 Flora Di Donato is an Assistant professor of Philosophy of Law, at the Federico II University of Naples, where she teaches Clinical Legal Education (Formazione Clinico Legale). Her research focuses on the analysis of the law in real life and the contribution of lay people in constructing the meaning of the law. In 2010 she was awarded the Annual RCSL Adam Podgórecki (ISA) Prize "for her outstanding achievements as an emerging scholar in socio-legal research". She has been a research fellow and a visiting scholar in several different Swiss and USA Universities.